A hyperlocal site set up by an MA journalism student at Brunel University claims to have received more than 1 million page views in a day, after live blogging the riots across London. Editor of the West Londoner, Gaz Corfield, told Journalism.co.uk the live blog "went viral" with traffic mainly driven through Twitter and Facebook, as well as links left in comment threads on national newspaper websites. Corfield, who is also on the hunt for a journalism job, set up the site after editing the campus newspaper at Brunel, which he said "whetted my appetite for journalism". "My original concept for what is now the West Londoner was for a hyperlocal site focusing on Uxbridge, chiefly to keep my reporting skills sharp while I'm looking for a job. "A handful of my friends from around West London, including fellow Brunel students, are helping out with the site as well. I must give special mentions to my amazing girlfriend Xenia Coudrille and also to Ricky Compton, both of whom were utterly invaluable at keeping the site running." He added that the site began as a "proof of concept test", which was not planned to go public until later this week. "I started liveblogging to see whether it was something I could keep up with. "I posted it on Facebook and tweeted it twice, more in hope of getting feedback than anything else, and gained a few hundred page views that way. "I took that as the signal that people were interested in my coverage and on the following day set myself the target of updating at least every three minutes. "At the peak of Monday's riots I think the actual speed of updates dropped to a little over 50 seconds at one stage!" According to Corfield, the site received more than 1 million page views in just 24 hours. "It's gone viral – Twitter and Facebook are our two biggest traffic drivers, although people in comment threads on national newspapers have been posting links to us as well. "Internet forums and discussion boards have picked up on us as well." 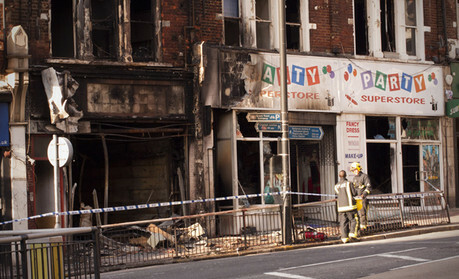 Follow this link for a Q&A with Corfield on how he coordinated coverage of the UK riots on Journalism.co.uk's editors' blog.